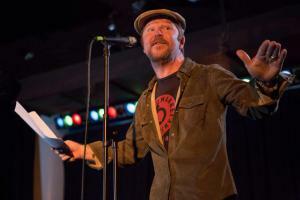 This week on Writing on the Air, we talk with author Owen Egerton about his work as a writer, teacher, and performer. We broadcast our show every Wednesday from 6-7pm Central Texas Time. You can listen to us by tuning to 91.7FM KOOP.org in Austin, Texas. You can also stream the show from anywhere around the world with an internet connection at KOOP.org. Writer and performer Owen Egerton is the author of Everyone Says That at the End of the World, How Best to Avoid Dying and The Book of Harold, the Illegitimate Son of God, which was optioned by Warner Bros. television. He’s written for Salon and The Huffington Post and is one of the talents behind the award-winning Master Pancake Theater at the Alamo Drafthouse Theatre. Egerton has written screenplays for Fox, Warner Brothers, and Disney studios. Voted Best Local Author by The Austin Chronicle five times. You can find out more about Owen by visiting his website, OwenEgerton.com.